Bellissimo translated into English means lovely. I strongly believe that no matter where we are in our lives we all should feel lovely. Sometimes that comes about due to some kind words but sometimes it rests on us to make ourselves feel lovely no matter what is going on in our lives. I know for me having my nails done is a big treat. Due to some of the auto-immune diseases I have and some of the drugs I need to take, my nails are brittle, ridged and dented. One has a fault and it cannot grow. Every little millimetre it grows just causes a vertical split. One of the few things that helps is having a manicure and if I go all out and have a Shellac (two-week manicure) it kind of holds my nails together. And of course makes me feel lovely. 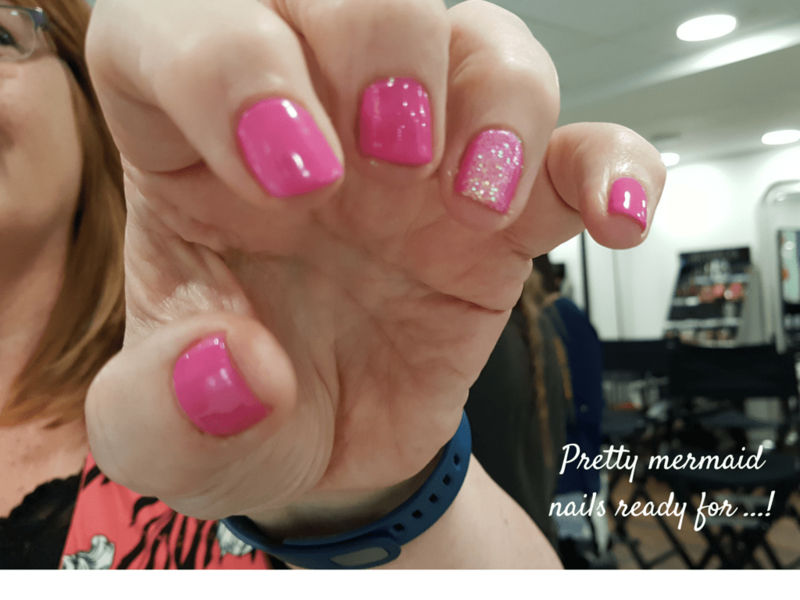 I was treated to a beautiful ‘mermaid’ themed shellac manicure at a blogger pamper evening held at the very aptly named Bellissimo salon in Galway. My comment – these nails look so good I might have to scratch someone just to show them off. Of course there might be other ways of showing them off too. It was such a fun evening, hanging out with ITWBN bloggers having manicures and pedicures while eating delicious food supplied by the g Counter. Honestly it was a bit like a grown-up slumber party with lots of giggling and laughing as we had the run of the salon for the night. The biggest laughs of the evening came about when we started trying on wigs. There were shrieks of laughter as we transformed ourselves into different characters by simply changing our hair. Loads of giggles. Wigs however are a medical necessity for many women. A couple of years ago when I started on Methotrexate to treat arthritis a lot of my hair fell out! I have always been quite proud of my hair and I can tell you I panicked. Hair wash day became worry day as the plug hole filled and each stroke of the brush meant less hair on my head. Thankfully I didn’t loose all my hair, and by using vitamins and other tricks and techniques (which you can read about here), I was able to get back on track. I regularly trimmed my hair and waited hoping it would grow back. Many many woman are not as lucky. Various conditions and drug programmes result in thinning hair leaving woman feeling less lovely than they should be. 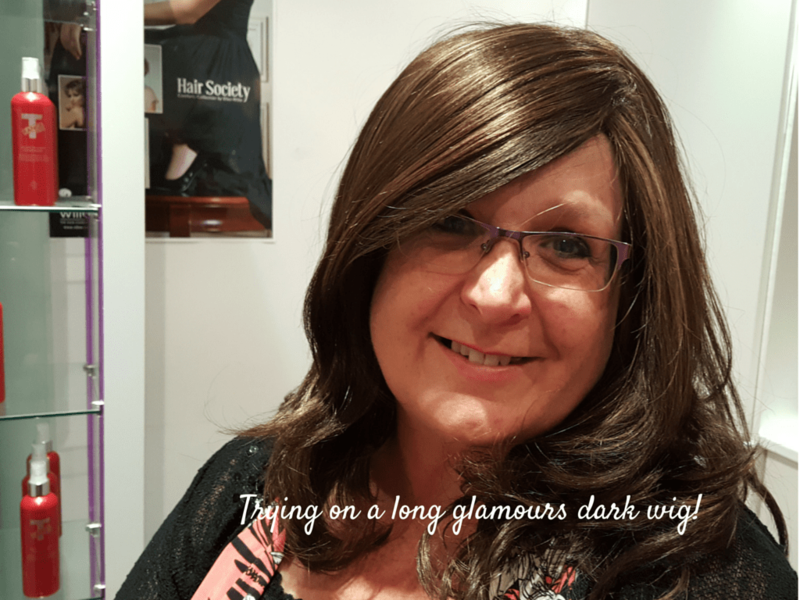 As we clowned around in the wig room at Bellissimo I couldn’t help thinking how important wigs are to so many people. Many of the wigs available look so good, you wouldn’t realise that they were exactly that. These wigs are well made and although synthetic would make anyone look fabulous – even if they were simply having a bad hair day. I spoke to Mike and Dympna our Bellissimo hosts who explained that because the salon was registered with the HSE (Ireland’s health service), there was a contribution that could be claimed against the purchase of a wig if hair loss was medically related. The staff is fully informed and are happy to help anyone in a confidential way. You can also have a look at the info on the website. I can promise you that anyone leaving the salon would feel fabulous! Bellissimo in Galway is a simply gorgeous venue. I really couldn’t think of a better name for a salon that makes woman feel lovely! Thanks to the staff and the lovely ITWBN bloggers for having a pretend slumber party with me. I felt Bellissimo going home.